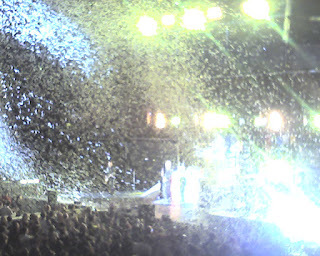 We went to the Newsboys concert in the Spokane Arena on Friday. I have seen the Newsboys in concert several times including a few times in Spokane, and two times at The Creation Festival at the Gorge at George Washington. These guys are flat out awesome. Their visual stage show is always high energy and high tech. The Newsboys' music doesn't disappoint either. These guys just keep on making awesome music with an anointed message. Although they had a different look since Paul Coleman is now taking the place of departed member Bryan Olesen, and Phil Joel has departed (December), they haven't missed a beat. The Newsboys kept us energized and focused on God with their high energy tunes, great stage show, and truly blessed lyrics. If you haven't purchased their latest album Go I highly recommend you go out and get it.